Here in a few days, four days to be precise, March 31, 2017, Family Tree Maker 2017 will be released. In the meantime, there are a few things you need to be aware of, although if you are a long-time FTM user, you probably already are. Note: This applies to both Mac and Windows users. First, this coming Wednesday, March 29th, 2017, Ancestry’s TreeSync is going away at midnight (Mountain Time here in the US). The reason being is that its replacement, FamilySync, will be rolled out on March 31st, 2017, with the release of Family Tree Maker 2017 (which is what both the Mac and Windows versions will be called). According to the email I received, if you plan on continuing with FTM 2017, your trees that are linked with Ancestry will still be linked, but you will sync them through FamilySync. If you do not plan on upgrading, and if you have items you want to synchronize with your Ancestry tree(s), you need to do so now, prior to midnight on March 29th (MST). 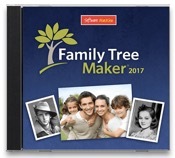 If you paid for Family Tree Maker 2014.1 or Family Tree Maker for Mac 3.1 from MacKiev, and have signed up on their mailing list, upgrading to FTM 2017 is free. Important: You can verify this through the MacKiev Family Tree Maker Verification/Upgrade. If you purchased an older version of Family Tree Maker 2014 or Family Tree Maker for Mac (say through Apple’s Mac App Store), you can still get a very good deal on pre-order upgrade price – $29.95 (USD). You can pre-order through MacKiev – Family Tree Maker 2017 Pre-Order, but only until FTM 2017 launches on March 31st. After that, the upgrade price is $39.95. If you are new to FTM, the price is $79.95. If you are worried about editions – the US, Canadian, UK, and Australian versions are included, and you simply select which one you want while installing. Windows: Windows 7 or later, 675MB Hard Drive Space, 2GB of RAM, 1024×768 display (or better). Once it’s officially released, we will be discussing it a lot more in detail.